Donald Trump insists that the investigations into his campaign’s ties with Russia are all a “hoax.” But an expansive probe that goes beyond Russia was launched by the House Judiciary Committee on Monday, and could lay the groundwork for impeachment proceedings, potentially posing the biggest threat to date to his presidency. 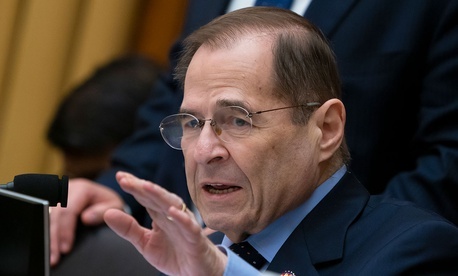 Nadler’s expansive probe appears to encompass several lines of inquiry that have been examined intensively by federal and congressional investigators for the past two years. Special Counsel Robert Mueller has been investigating a potential conspiracy between President Trump’s campaign and Russia. New York prosecutors are reportedly investigating Trump’s inaugural committee for potential campaign-finance violations. And the House and Senate Intelligence Committees are also examining, among other things, Trump’s decades-long real-estate career. Nadler has said he believes that Trump obstructed the ongoing federal and congressional investigations into the Trump campaign’s ties to Russia—the most decisive comment made by a Democratic leader yet on whether Trump had tried to interfere with the investigations. Nadler’s comment marked a noticeable shift in tone for a top Democrat, many of whom have deferred to Mueller’s inquiry when asked about the president’s alleged abuses. The document requests varied in subject and scope. In a request to the former Trump campaign adviser Carter Page, for example, Nadler appears to be homing in on alleged collusion between the campaign and Russia. (Trump said on Monday that he cooperates “all the time with everybody … You know the beautiful thing — no collusion. It’s all a hoax.”) Nadler asked for all documents relating to changes to the Republican platform in 2016 dealing with Russia and Ukraine, discussions of sanctions policy with regard to Russia, and the June 2016 Trump Tower meeting between Trump campaign officials and a Russian lawyer. In a letter to the FBI, meanwhile, Nadler seems to be zeroing in on questions of potential obstruction, asking for any communications involving Trump and his associates about the firing of former FBI Director James Comey in May 2017. And in a letter to the CEO of American Media, David Pecker, Nadler requested more information about payments made to the benefit of the Trump campaign that might have violated campaign-finance laws. The Trump campaign’s digital director, Brad Parscale (now Trump’s 2020 campaign manager), received one of the most extensive document requests, covering everything from plans for a Trump Tower Moscow in 2016 to Trump’s conversations with Russian President Vladimir Putin in 2017 and 2018. Notably, Nadler’s document requests to Trump’s sons Eric and Donald Trump Jr.—neither of whom hold White House positions—ask for communications relating to several internal government decisions after Trump took office, including the recusal of former Attorney General Jeff Sessions from the FBI’s Russia investigation. Democrats have long said they want to wait to act on impeachment until after Mueller issues his final report. But Attorney General William Barr’s refusal to commit to providing Mueller’s findings to Congress—combined with the recent testimony by Trump’s longtime personal lawyer Michael Cohen that Trump implicitly asked him to lie to Congress—has given Democrats a new sense of urgency. As I was told earlier this year, the Democrats won’t necessarily wait to hold Trump accountable if they conclude that he knowingly obstructed justice to hide his involvement in business negotiations with the Kremlin during the election.